With muscular men often gracing the covers of magazines and capturing the limelight in entertainment, skinny men can feel short-changed. Skinny men — or ectomorphs — tend to burn calories fast and have a hard time gaining weight and muscle mass. 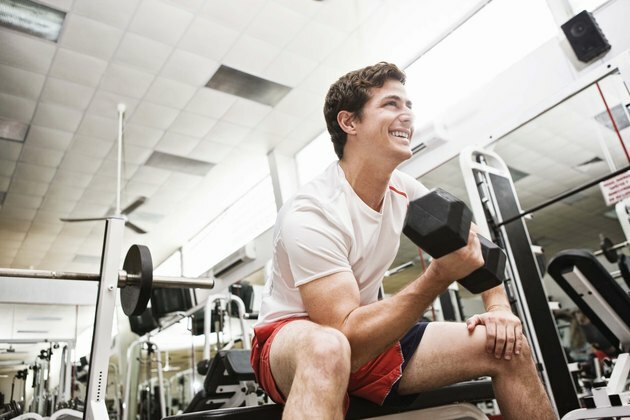 If you are a skinny guy who wants to get stronger and add muscles to your frame, you can achieve success by following a weight training routine that suits your body type. The American College of Sports Medicine recommends that adults lift weights twice a week by doing eight to 10 strength-training exercises with eight to 12 repetitions of each exercise for good health. 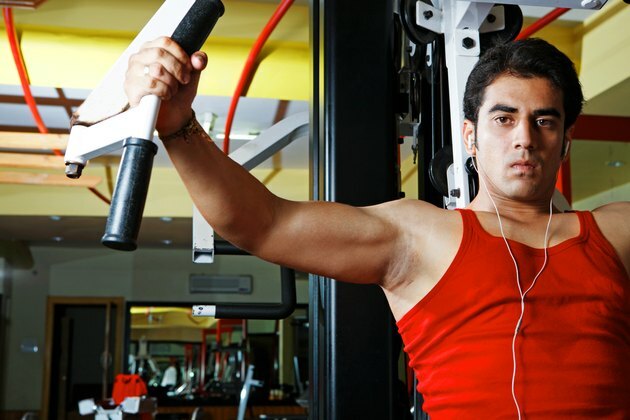 To increase muscle strength and bulk, skinny guys should do a lower number of repetitions using higher weight amounts. For instance, try doing four to six repetitions of 50-lb. weights instead of 10 reps of 30-lb. weights. Follow a weightlifting program that works all of your major muscle groups, including your arms, shoulders, back, abs, legs and chest muscles. Free weights — such as dumbbells and barbells — can offer a challenging weight workout that also improves balance. Skinny men should use high amounts of weight to do a few repetitions of exercises such as the chest press, squats, lunges, dead lifts and biceps curls for a muscle-building free weight workout. When using heavy weights with large barbells, be sure you have a spotter and do not use weights that are so heavy you cannot lift them or feel pain when you try. Weight machines generally offer more support and guidance than free weights, and can work all of your major muscles. As with free weights, if you want to build muscles and bulk up, lift higher amounts of weight with a low number of reps. Some weight machine exercises that work major muscle groups include the chest press, bench press, shoulder press, leg press, triceps extensions and leg curls. 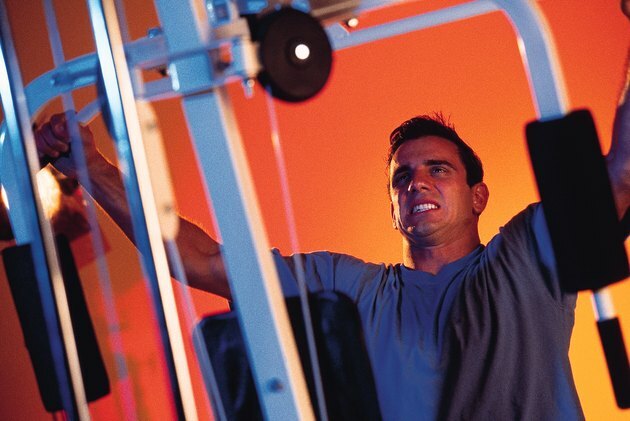 If you do not know how to use a particular weight machine, ask a trainer for guidance. If you want to gain weight, the basic formula is to consume more calories than you burn. Ectomorphs tend to burn calories quickly, Men's Fitness states, making it harder to gain muscle mass. You can add an extra meal or calories to your diet each day to help replenish the calories you burn lifting weights, as well as furnish extra calories for building muscle. Choose protein-rich foods and foods with healthy fats — unsaturated fats — for sources of energy. 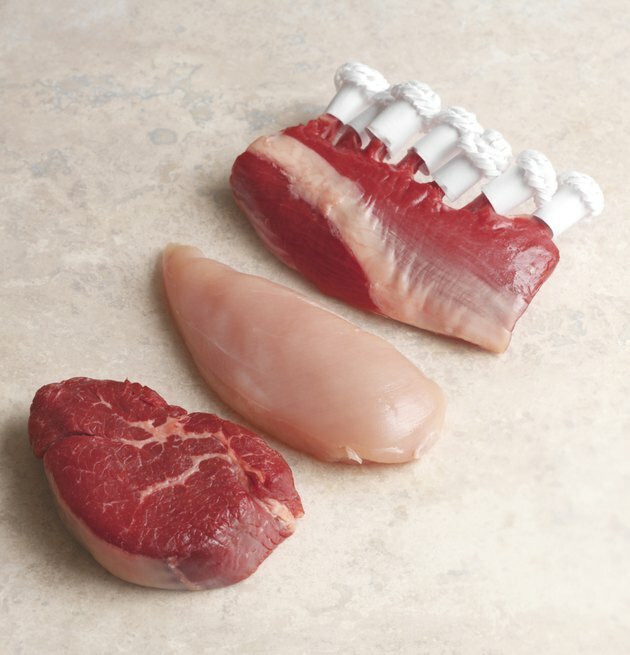 Men's Fitness recommends eating .6 to .8 g of protein per pound of your body weight daily. So if you weigh 150 lbs., you should consume 90 to 120 g of protein daily. 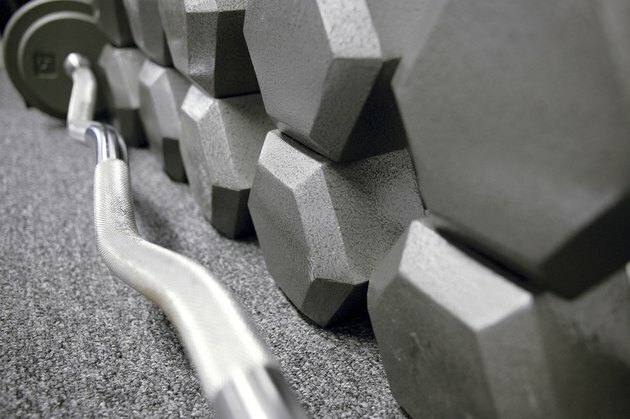 Consult your doctor for a clean bill of health before beginning a weightlifting program. Certain health conditions, such as hyperthyroidism, can cause weight loss or muscle atrophy. When you begin a weightlifting program, work up to doing heavier weights to build muscles. Do not start out with heavy weights your first workout, or you will be more likely to tear or strain a muscle. 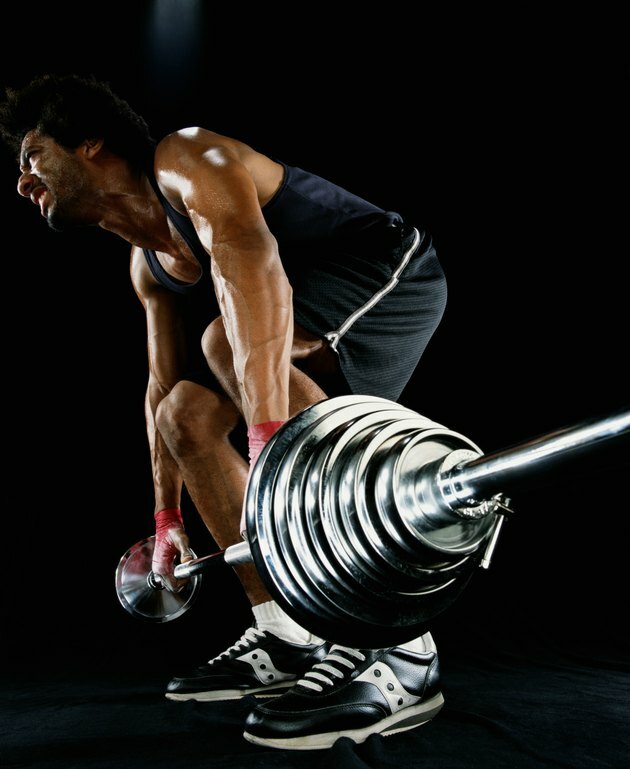 If you feel any sharp or lasting pain while weightlifting, stop immediately and consult your doctor.